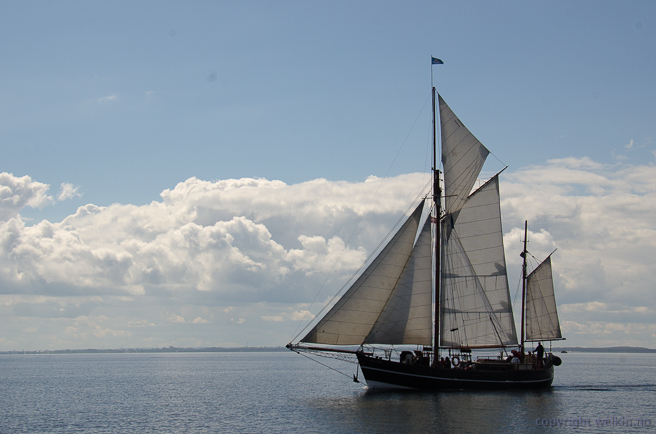 The local sailors came in to the end of the Flensburg Fjord (i.e. centre of the city) turned around and sailed out again - it must be to show off their boats after a long winter! The day was spent shopping all around town and to meet up with family. 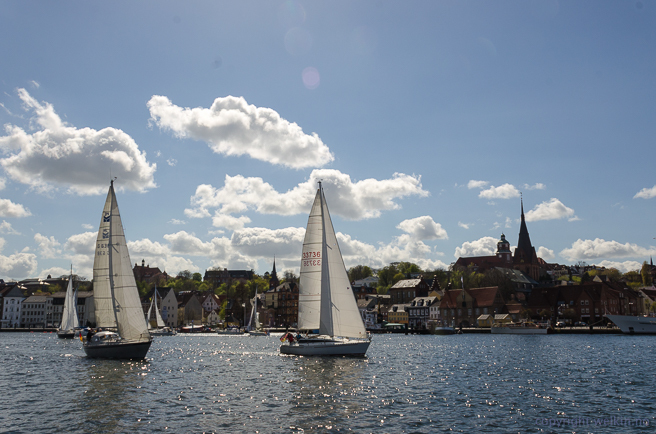 Flensburg is the ideal place to stock-up for the trip to the north. There are plenty of shops (way too many for such a small city), with a vast offer of food and spirits and whatever else one needs or doesn't need, and, as it was a long week-end (1. may) the city was overrun by Scandinavians. Shopping in Germany is incredible cheap, compared to northern Europe, and the places in Flensburg accept credit cards, which, as we had to find out later, is not the case in other places of Germany. The harbour costs were 17€/day inclusive internet, but no electricity, again cheapest so far on our journey. And we did some washing here. Entering the Flensburg Fjord, we met this yacht. Weather forecast or weather went wrong again - we were promised WNW 4-8 m/s, and ended up with no wind at all! Therefore the iron genoa had to bring us all the way to Flensburg. No wind this morning, although the weather forecast promised 4-8m/s, so for engine again, at least through the first shallow stretch. This is actually SNOW!?! on the sprayhood! 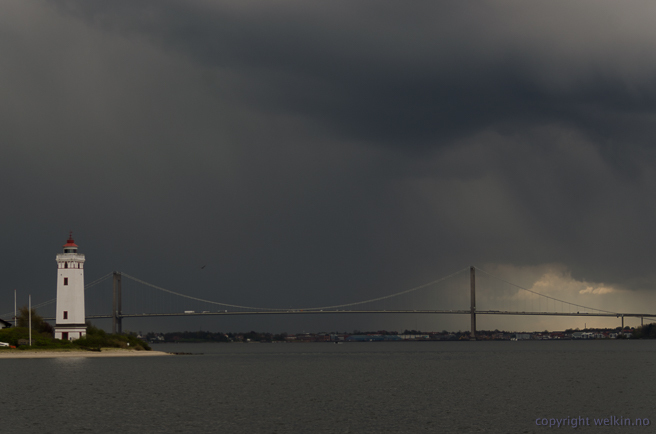 The sail got out later, but just for a short while, because a squall approached. 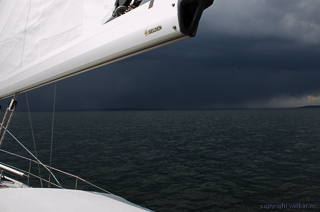 We got soft hail and 14m/s wind when it hit. 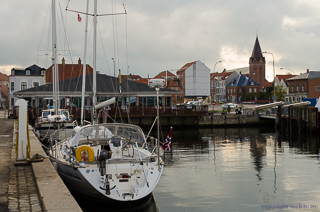 When entering the Little Belt, the weather didn't improve and we had a pit stop in Middelfart for some shopping. Arriving at Assens we decided to go to the harbour in the city centre, which is reserved for boats from 12m and larger. Unfortunatly the supermarket was at the other end of the pedestrian area, so the first mate had to walk a bit to do the shopping. 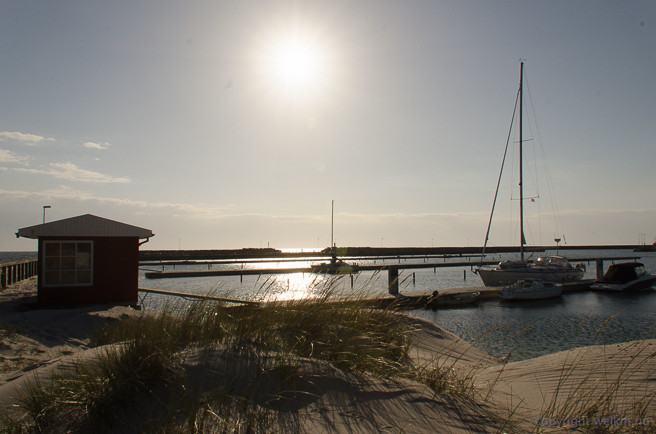 There is a large guest harbour on the other side of the bay, about a kilometres walk to the city. Not so pleasant weather and waves today. 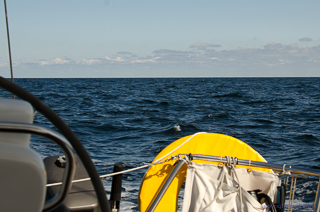 Off before 07:00, to catch the W wind and make progress, but the wind was more WSW and the waves were short and stumpy. Well, we sailed as best we could for more than 6 hours. 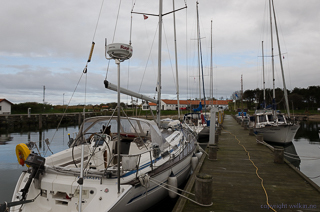 At about Grenaa we were sheltered by the land and the wind dropped, so we opted to go to Tunö on engine. 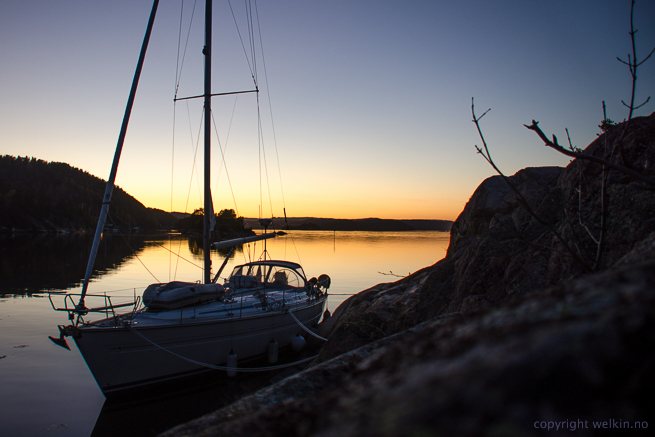 After beeing bounced around for 12 hours, it was nice to tie up in a sheltered harbour. 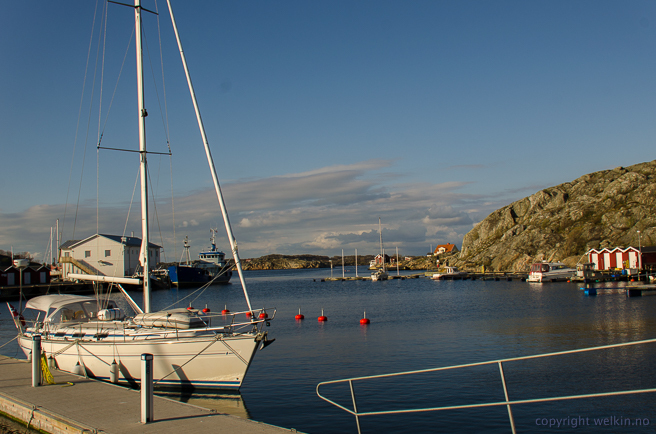 The guest harbour at Tunø was quite busy, we counted 7 other boats! 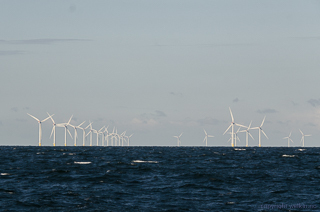 Left; A windmill park well off the coast between Anholt and Grenaa. Above; We were the only real guests in the harbour, the other boats were locals. 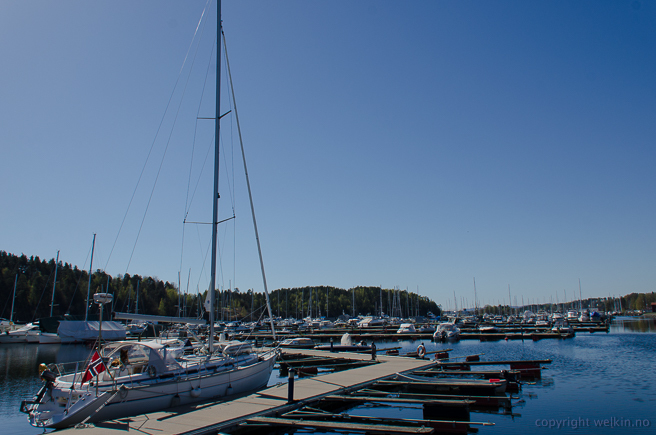 In the summer this harbour is full, check out our visit in 2011! The Swedes have now decided that you cannot dump your septic in the sea anymore. Left; You can see how far we had to go from Sweden before we could open the valves! Well, with the current and wind I guess it drifted back into Sweden anyway! 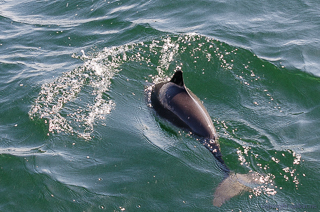 Below; A dolphin played around the boat for a while. 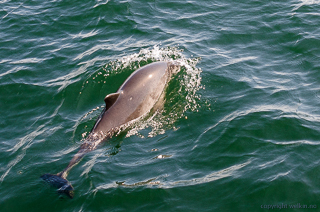 Above; We were the first guest in the harbour this year!! Early start again, going out the small channel and out into the open sea for a while. 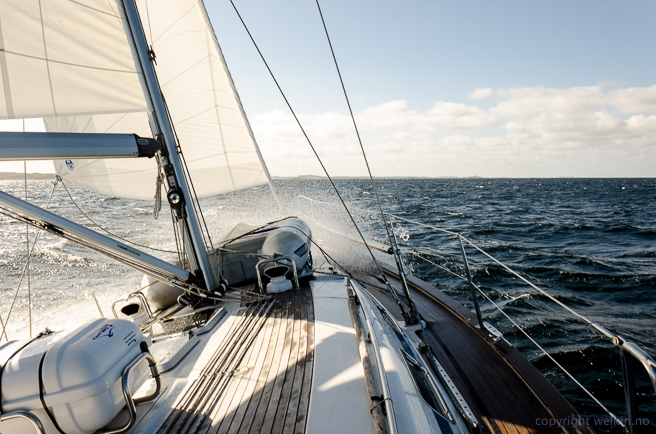 The weather was nice and a good sailing wind brought us a bit further. We had to stop over in Marstrand to get some bread and some expensive diesel ( almost 2€ a litre!). 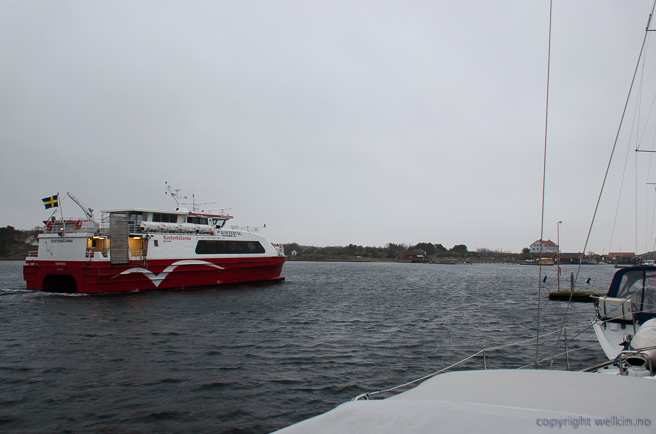 Continued a more sheltered fairway past Gothenburg to Sandviken at Styrsö ( harbourfee only 135SEK - with power and wifi! 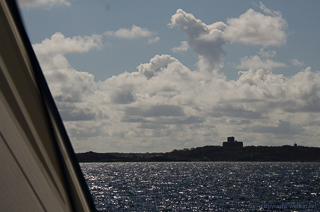 Left; The fortress at Marstrand is a landmark easy to spot from far away. 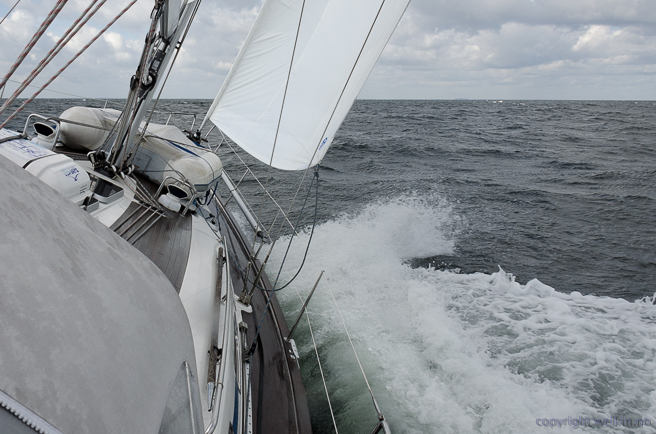 Above; Nice sailing, still heading south! Off to an early start today - sunny and a nice fresh westerly breeze. Although it was warmer yesterday, the sun made the difference and we could sail until the late afternoon and cover some distance. Just after arriving, a sparrow landed on the boat, then one more and another and in the end there were 25 sparrows sitting around the cockpit. 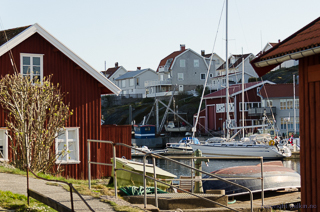 Gullholmen is full of old fishermen's houses. 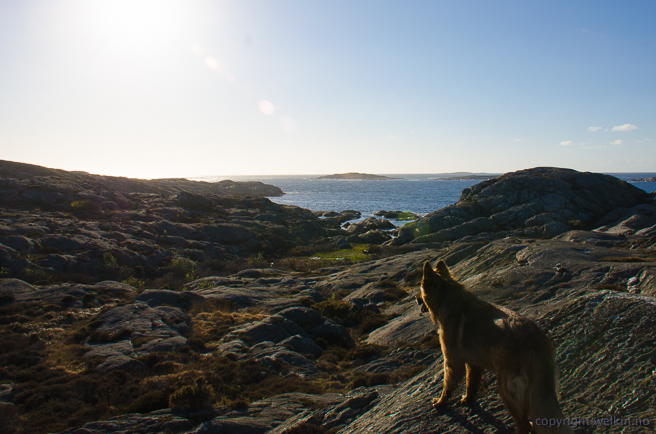 We even got time to take the dogs for a walk on the island! Above; The ferry from the mainland arrives! 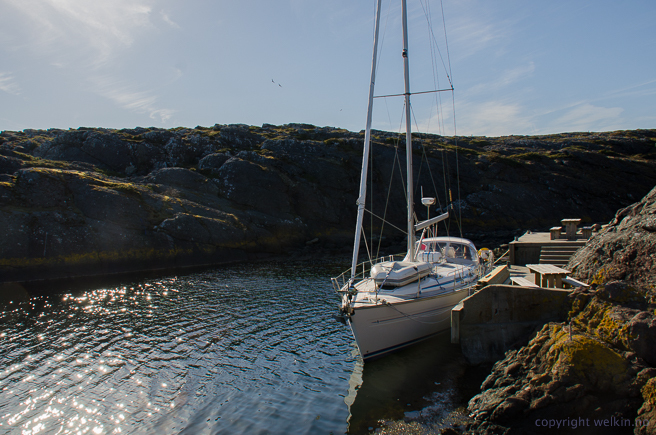 Too cold to put up the sails today, so we motored between the islands and against a fresh breeze to the Swedish island Nordkoster. Wet, cold and with a visibility of only 1nm we moored alongside and ran below deck where the heater was putting out all of it's 5.5kW in order for the crew to de-frost! Rain - wind - and super cold - I thought we were heading south to warmer weather!?! The day was spent with some last preparations and taking the dogs for a long walk along the path by the river Glomma. With a industrial sowing machine and good help from a friend the long awaited 'raintop' was finished - looks nice - doesn't it? 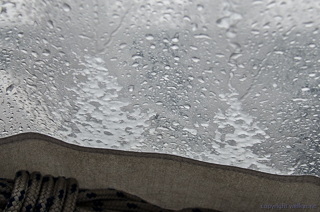 The pattern for the 'raintop' were made already 2 years ago at Skjervøy on the way to the North Cape! 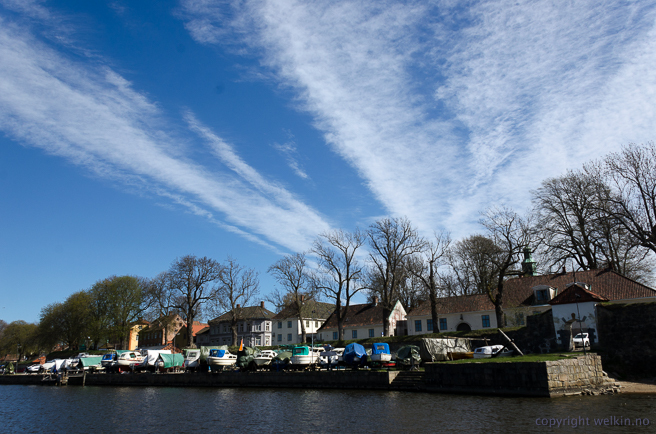 Above; The quay outside the old city of Fredrikstad is still full of boats - they too are waiting for the summer! 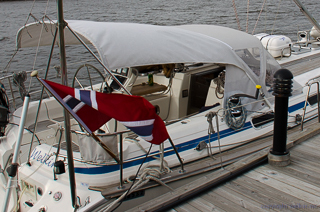 Short leg today in sun and nice wind to visit friends up the river from Fredrikstad. Above; Once again in the magical harbour at Missingene, we will be missing it! We started out with no wind and the current with us, but at half way we could set the sails - now with both wind and current against us. 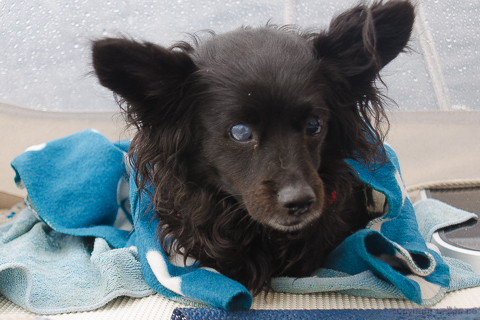 When the wind picked up, the chilling factor reminded us that it is not summer yet! The long underwear has to stay on for a bit longer! 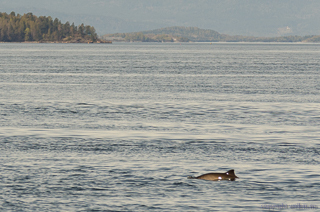 Right; Just before the wind arrived, a couple of harbour porpoises waved us goodbye on our trip out the Oslo fjord. The day was exceptional sunny and nice; the Oslo fjord was showing its most beautiful face, so that leaving the place, which has been Welkin's home for nearly 15 years was making us feel very nostalgic. No wind to talk about on our first short leg to Sandspollen, and whenever there was a bit of breeze, it reminded you of the snow and ice, which still could be spotted from the boat! 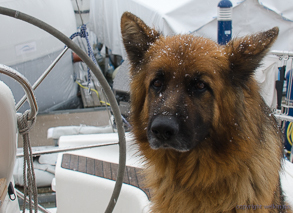 Above; Ready to leave, just waiting for the first mate and the first dog to arrive from Spain! A new plotter and radar was installed a couple of weeks ago. AIS transceiver is also in place. The rev counter has been exchanged. The hull has been deprived of blue shell enough to serve 12 persons and the propeller lost its cover of barnacles and received a new coat of antifouling. The winter duvet is off and some washing and polishing has been done. The boat is tidied up below deck, cleaned and stocked up with spares parts and supplies. Why are we doing this and what are those white things falling from the sky?? ?